Home » Blog » Why a woman’s work is never done!! Why a woman’s work is never done!! If you are a woman reading this, you know most days you feel like you never get on top of the work load. I have a “To Do” list that seems endless. Of course, I can blame having to work outside the home for part of the endless stress, but I think there is another component we tend to overlook. Technology may be part of the problem. 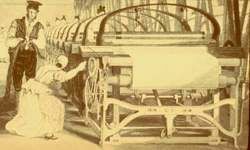 I don’t think anyone will dispute that these inventions were all labor saving, but as technology continued to transform women’s lives expectations of what women could and should do also changed. We know that Europeans had heating stoves in the 1500s. By 1650s Rembrandt had painted a woman in partial undress sitting before a stove. Heating stoves caught on because they heated more evenly and consistently than fireplaces. Installed in the middle of a room or in a sheltered corner they were quite successful in bringing the room’s temperature to a reasonably tolerable level. I n the 30 years between 1810 and 1840 the population of the United States more than doubled. Manufacturing improved and due to better transportation the freight costs went way down. These changes encouraged acceptance and use of both heating and cooking stoves. 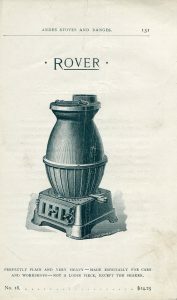 Between 1835 and 1839 one hundred and two cookstoves were patented. A good part of this inventiveness was driven by high prices of fuel for heating and lighting. A less appreciated facet of this patent explosion is that the majority of the innovators were men who did not have to use the product they invented. Did the cookstove save women work? It depends on who you were and what your duties were. A fireplace required brining wood into the house, maintaining a fire, sweeping out the ashes and being quite adept at cooking over an open fire. A reasonably trained cook would be able to roast, stew and bake in a fireplace. Of course, lifting the heavy cast iron cookware from hooks to hearth and tending the meal over an open fire required strength and care. It was easy to catch your clothes or even hair on fire when leaning over a fire in a large fireplace. It was simpler to cook one dish meals over a fireplace. Soups, stews and boiled puddings demanded little in the way of fussy preparation. Also, fireplaces were dirty, inefficient and could smoke abundantly at times. 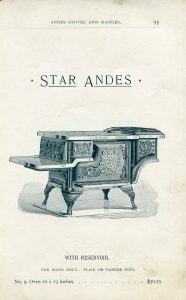 A wood or coal cookstove had its own set of benefits and drawbacks. The stove needed to be blackened regularly if it were to look nice. Fires, especially coal fires, were hard to get started and even harder for the neophyte to keep going. Baking ovens were hotter, baked more quickly and items in the oven had to be more closely watched to insure even browning. Along with the stove came the expectations that dinner would no longer be a stew or soup with bread, but a dinner of more than one course might be anticipated. Cook stoves, sewing machines and bicycles were not the first innovations in technology that would change women’s lives. They were followed by wash machines, dishwashers, dryers, vacuums, toasters, and much later microwaves and coffee makers. All these nifty gadgets made our life less strenuous, but raised standards of cleanliness, housekeeping, cooking and baking not to mention raising expectations of immediacy. I will end this with the idea that technology has both lightened women’s physical labor, but increased the amount of work we do to meet the higher standards of excellence now expected because of the technology. How do you feel about it?